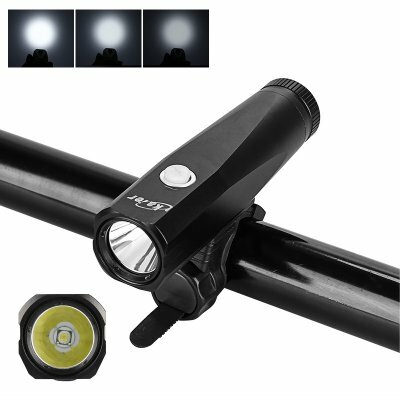 Successfully Added XML-T6 LED Flashlight - 800Lumens, 2 Bike Mounts, IP65 Waterproof, XML-T6 LED, 5 Light Modes, Reinforced 6061 Body to your Shopping Cart. Made from a lightweight yet tough aluminum this pocket flashlight is designed to last and can operate in all weather conditions thanks to its IP65 waterproof rating. Using an XML-T6 LED it offers a bright 800 lumens output to light your way. The reflector cap and nano-coted lens ensure the light is efficiently directed where you want it. Powered by a 18650 battery you can enjoy good usage times and with its intelligent circuit that can cycle charge and discharge this torch can quickly and safely be recharged via its USB port. Coming with two bicycle mounts the flashlight it easily clipped onto your handlebars and can be swapped between two bikes with a minimum of effort. The compact LED flashlight is lightweight and compact yet has a powerful beam that will guide you along at night and keep you visible to others. There are 5 modes on this flashlight, high, medium and low as well as strobe and SOS function which are ideal for catching others attention. Whether you need a light for walking the dog, late night strolls on an emergency torch for car breakdowns or home power cuts this 800 lumens LED flashlight is an affordable and powerful option. This LED flashlight comes with 12 months warranty, brought to you by the leader in electronic devices as well as wholesale LED lamps, torches and lanterns..